PEBBLE BEACH, CA (September 27, 2017) - At least for a day, it was all about the guys from the Olympic Club. 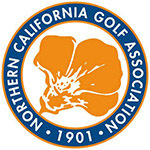 Four players–leader Bruce Hanavan, Gary Vanier, Randy Haag and Mike Staskus–who are members of the esteemed club all came up solid in Wednesday’s first round of this week’s annual NCGA Senior Championship at par-71 Poppy Hills Golf Course. The 59-year-old Hanavan, who paced the pack, couldn’t have asked for a better way to start the championship, opening with an eagle 3 on the par-5 1st. From there, he’d tack on three birdies to go against just two bogeys to finish with a 68. Just a stroke behind at 69 is Vanier, the defending NCGA Super Senior Player of the Year. Vanier, who now lives part-time in Idaho, also got off to a quick start. Beginning his round on the par-5 10th, the two-time NCGA Senior champ (2009, 2013) rolled off three straight birdies to open his day. He’d post two more birdies to go with two bogeys the rest of the way. Haag didn’t have a flurry, but he’d also get off to a nice start with a 70. The current leader in the NCGA Senior Player of the Year points standings had four birdies and three bogeys. Staskus, who has a habit of playing well at Poppy Hills, opened with a 71 and is tied for fourth with Matt Vukicevich, a member at Fountaingrove Golf and Athletic. Following Thursday’s second round, a cut will be made with the low 33 (and ties) advancing to Friday’s final round.